Umkhumbi Lodge is deluxe bush lodge set on a private nature reserve near the safari hub of Hluhluwe. 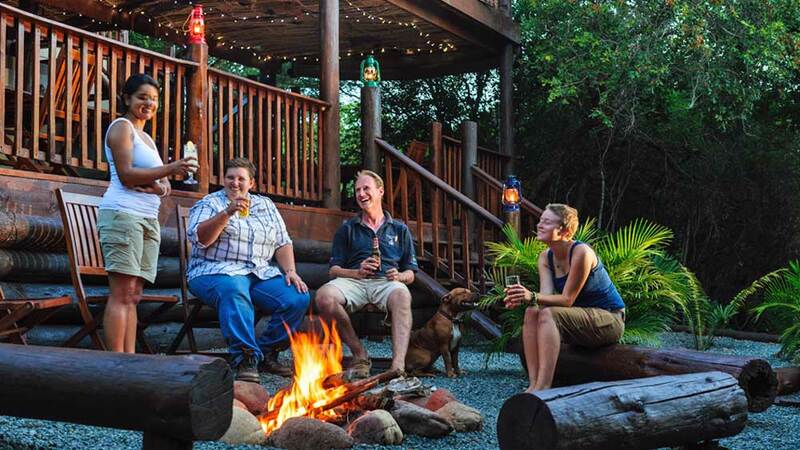 With easy access to both bush and beach Umkhumbi is an ideal base for families and small groups to explore and experience a wide range of activities. Nestled in the peaceful forest are six very private double units, each with two spacious en suite, air-conditioned rooms. The rooms are connected by inter-leading doors, making them perfect for families. The high ceilings, cool floor tiles and huge windows create a light, airy feel. Sliding glass doors lead onto a generous verandah, surrounded by trees, with the odd duiker wandering past and birds flitting in and out of the bush. Big-5 game drives, whale watching, turtle hatching, elephant, cheetah or crocodile encounters are all within easy reach of Umkhumbi. The hub of the lodge is a double storey ‘lapa’. Rendezvous on the lower deck for breakfast to discuss the day’s outing. In the evening guests can dine privately or join the Roberts family at the communal table. Upstairs is the convivial Umkhumbi Bar, lounge area and an extended deck to enjoy sundowners and watch technicolour sunsets. Families, particularly those that enjoy active, adventurous, outdoor pursuits and love exploring independently. Repeat visitors especially those seeking a genuine South African experience, rather than a hotel. The convenience of inter-leading rooms, swimming pool and skilled kid-friendly staff make Umkhumbi a hit with families. Small groups appreciate the lodges central location and the owners insights on getting the most out of each day. With easy access to both bush and beach set up base camp at Umkhumbi and head off on daily exploratory missions. Umkhumbi is ideal as a 2 – 3 night ‘adventure and explore’ stopover; though one could easily stay for a week. Combines well with Big Game Parks in Swaziland, Babanango Valley Lodge in the battlefields and the Cathedral Peak Hotel in the Drakensberg. For a classic highly affordable bush and beach trip combine with Amangwane Kosi Bay. The focus at Umkhumbi is on conservation through eco-tourism and delighting guests with the often overlooked “small stuff”. The Wetland Park Group seeks to partner up with grassroots and community based tourism initiatives, promoting, supporting and channelling business their way. Mbonise Cultural Concepts and Amangwane Kosi Bay are two of them. Umkhumbi is ideally located to explore the region which has so much to offer. Great hospitality, most comfortable beds we have slept in for a long time! Excellent food and a cold beer at the end of a day exploring the regions game parks and nearby St. Lucia / Cape Vidal. Resident wildlife and natural flora compliment the units. If you are anything like me who only sleeps in a room and is more interested in the activities the region has to offer, then the accommodation will be more than satisfactory. To summarize....quality accommodation in the right place and the right price....pure value for money. Go see for yourself.